Do you have trouble remembering your sign in information. 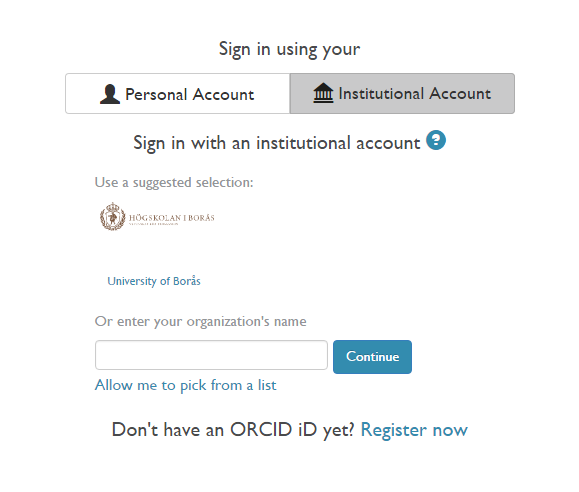 As of now you can connect your institutional account to log in to the ORCID site. To do this you go to the log in page and click on “Institutional Account” and choose the University of Boras in the field for organisation affiliation. When this is done you have to log in with your ORCID account to finish the connection. If you have already lost your password you can solve this with the function “Forgotten password”. when you have finished the registration you will be able to manage your log in information using the “account settings” in ORCID. If you want you can also connect other sign ins like those connected to you Facebook or Google account. you find more information on the ORCID development blog.